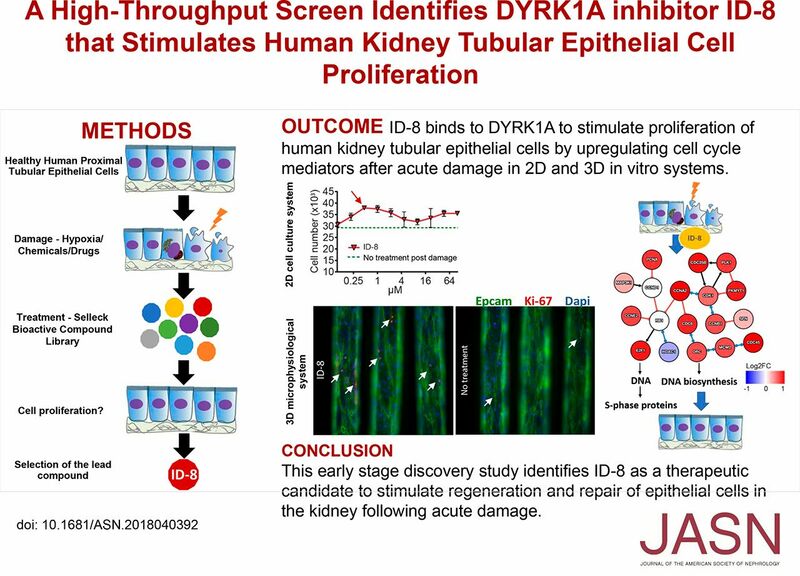 Background The death of epithelial cells in the proximal tubules is thought to be the primary cause of AKI, but epithelial cells that survive kidney injury have a remarkable ability to proliferate. Because proximal tubular epithelial cells play a predominant role in kidney regeneration after damage, a potential approach to treat AKI is to discover regenerative therapeutics capable of stimulating proliferation of these cells. Methods We conducted a high-throughput phenotypic screen using 1902 biologically active compounds to identify new molecules that promote proliferation of primary human proximal tubular epithelial cells in vitro. Results The primary screen identified 129 compounds that stimulated tubular epithelial cell proliferation. A secondary screen against these compounds over a range of four doses confirmed that eight resulted in a significant increase in cell number and incorporation of the modified thymidine analog EdU (indicating actively proliferating cells), compared with control conditions. These eight compounds also stimulated tubular cell proliferation in vitro after damage induced by hypoxia, cadmium chloride, cyclosporin A, or polymyxin B. ID-8, an inhibitor of dual-specificity tyrosine-phosphorylation-regulated kinase 1A (DYRK1A), was the top candidate identified as having a robust proproliferative effect in two-dimensional culture models as well as a microphysiologic, three-dimensional cell culture system. Target engagement and genetic knockdown studies and RNA sequencing confirmed binding of ID-8 to DYRK1A and upregulation of cyclins and other cell cycle regulators, leading to epithelial cell proliferation. Conclusions We have identified a potential first-in-class compound that stimulates human kidney tubular epithelial cell proliferation after acute damage in vitro.